Explore Sri Lanka surf holiday destinations in Sri Lanka. Population: 20 million Location: Indian Ocean, directly below IndiaMain surf area: South West & South East coastline Language: Sinhalese, Tamil, some English Currency: Rupee Year round surf: Yes Most consistent surf: South West: November to April. South East: May to October. Sri Lanka surf holidays are right up there as one of our favourite in the world. The country has so much to offer for both the adventure traveller and surfer. Long sandy beaches, fun point breaks and a great mix of accommodation depending on your budget. If you’re looking for that perfect spot where you can surf fun points and lie in a hammock, you’ve found it! Shaped like a teardrop below India, the country divides the Arabian Sea from the Bay of Bangal. Not unlike Indonesia the country is famed for having incredibly friendly people, an array of history to explore and some great surf. Unlike Indo, most of the waves here are much more user friendly breaking over flat reef or sandy points. Rusty Miller, the then US Champion, first surfed Sri Lanka in 1965 and described the island as a ‘Shangri-La’ for surfers. This is a statement that still holds true for the island, with the South coast being heavily populated by sand and reef breaks in crystal clear waters and white sand beaches fringed by palm trees. A multitude of smaller, friendly spots that will forgive wipe outs and allow you to focus on growing your technique, combined with an impossibly beautiful backdrop make for the ideal setting to take up surfing. The country has had a hard time over the last decade. 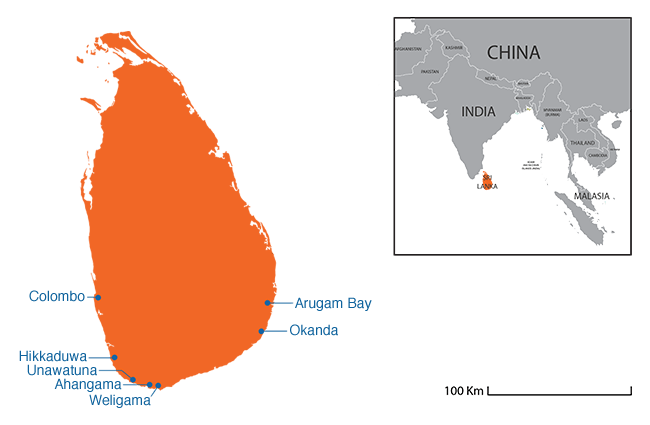 The Tsunami in 2004 caused massive damage to all coastal areas and destroyed over 80% of the countries fishing fleet leaving Sri Lanka in a state of repair to this day. Despite this the country is moving forward and the waves are as fun and as perfect as ever. Getting around can be interesting as with anywhere in Asia. Roads can be difficult but sure that’s what makes the journey interesting, right? The main road network isn’t bad but off the beaten track things can become a little more difficult. Surf culture in Sri Lanka is flourishing, new surf holiday accommodation and Sri Lanka surf camps are opening all the time. The annual SriLankan Airlines Surf Competition and Red Bull’s Ride My Wave are feeding a locally grown generation of surfers. The sight of tuk-tuk’s piled high with surf boards is not an uncommon one in Sri Lanka, and is probably the best way to get to and from the beach if you don’t want to hire a car. Public buses on the island are a less than ideal way of commuting with gear in tow, as they are generally over capacity and very tight for space. You can fly into Columbo airport and all visitors will need to get a visa on arrival, most opt for the 30 day version. Sri Lanka is an island of surreal natural beauty, jungle and beaches, enough to give a surfing holiday in Sri Lanka a deservedly high spot on your surfing bucket list! What's the surf like in Sri Lanka? Sri Lanka is an island of two halves, with the East and West of the island experiencing different monsoon seasons. This means that between November to April, the West side (1-3 below) of the island generates the best waves, while May to October is the best season for the East. Sri Lanka is not a big wave island, generally waves are mid-size, not overly powerful and never reach the ‘bomb’ category. This makes it an ideal place to begin surfing, or to pare back your surfing and really work on technique. That’s not to say that the surf here can’t be challenging, spots around Arugam Bay and Hikkaduwa regularly form fast, technically demanding waves. The beauty of the Sri Lanka surf spots is that it is still possible to move away from the main thoroughfare, and find yourself surfing with just sea turtles for company. When you do find yourself at a crowded break, respect for local surfers and knowledge of surf etiquette will get you a long way, and will also earn you some great inside knowledge on where best to surf. At the center of surf culture in the South West. This well-developed town has several surf shops and schools. Main breaks in this region are made of reef and sand. Benny’s at the front of Hikkaduwa town is a popular spot that breaks on shallow reef, and is for the more advanced surfer, or intermediate looking to push themselves. North Jetty, a left hand reef break directly beside the Hikkaduwa harbor wall is a great spot for goofies. The main beach break at Hikkaduwa town is sand bottom and an ideal safe place to get in to the water for the first time. Unawatuna, aside from being a fantastic name in itself, is also an off-shore reef break that picks up small but consistent runs of swell. NSlightly further West along the coast are Gallé, Midigama, Rams and Lazy Left. These are all fun waves with an easy take-off, that can barrel on bigger swells. The charming local town of Ahangama is closeby with a great selection of sandy beaches and secret spots. The fishing town of Weligama (actual translation is Sandy Village) is also a great place to stay or visit, a popular fishing town with a wave that lasts 400 metres! Nearby Mirissa is an idyllic tropical location that has both left and right breaks at either end of the beach. 306KM East of Hikkaduwa, 5 hours by car or 6 by bus and taxi is Arugam Bay (A-Bay). Often compared to Bali in the 70s, with beachfront cafés and restaurantsm beautiful beaches and a mellow kick back relaxed atmosphere. It is home to some great Sri Lanka surf camps. The area has what many regard as the best surf break in Sri Lanka, Arugam Bay reef break, a consistent wave that creates both rights and lefts over deep reef. Ten minutes from Arugam Bay are Crocodile and Elephant Rock, both are very friendly waves coming in over sand with little crowds and dreamy scenery. Further South is a break called Peanut Farm, a right hander that you’ll first need to take a tuk-tuk and then navigate tropical trails to get to (don’t be tempted to use a peanut farm as a good marker of where this break is, as there isn’t any for miles around!). What Peanut Farm will reward you with is a quiet, sandy right hander that you will have largely to yourself. About an hours drive down the coast from Arugam Bay is a spot called Okanda, a consistent spot that is usually off shore. Okanda is a fast, right hand, point break that works over rock and reef and is loads of fun for the more experienced surfer, or those looking to push themselves further. The most striking thing about the weather system of Sri Lanka is that it has a monsoon season that cuts the island in two. The monsoon season in the South West runs from May to September and in the South East from October to January. If you're planning a stay at a surf camp Sri Lanka just plan right and you shouldn’t encounter the sporadic torrential rain of the monsoon and instead enjoy the dry season sun! Water temperatures remain high all year round, holding steady in the region of 25°C. The great news is that despite the monsoon season Sri Lanka has an average 330 days of sunshine a year meaning board shorts, shorties and bikini’s are all you’ll need while surfing in Sri Lanka. Sun protection is something to consider both in and out of the water, as the mid-day sun is powerful and has most people heading for the shade. Surfholidays tips: Bring cash where you can as there are not many ATMs to take money out from in smaller towns.